HR&A created development, investment, and phasing strategies to support the award-winning Master Plan for the Central Delaware, and advised on redevelopment scenarios for a revitalized Penn’s Landing. Philadelphia’s waterfront once bustled with industrial activity, but as the City’s manufacturing and shipping sectors shifted to accommodate Center City’s growing knowledge-economy, the isolated waterfront deteriorated. Cut off from downtown by an interstate highway, the waterfront suffered from disinvestment, increased vacancy, and underutilization. In 2010, the Delaware River Waterfront Corporation, seeking to revitalize a seven-mile length of the central waterfront, asked HR&A and a team of designers, engineers, urban planners, and architects to create a master plan that would create an accessible riverfront, provide community amenities, and increase the values of surrounding parcels to encourage redevelopment along the waterfront. The resulting plan extends Philadelphia’s vibrant urban environment to the water by incorporating neighborhood-scale development, transportation connections, public-realm improvements, entertainment and cultural offerings, and open space and recreation opportunities. HR&A worked with the planning team to identify the initial steps needed to finance and implement these improvements, starting with an assessment of local demand for residential, retail, commercial office, flex, and hotel uses. This assessment helped shape the development program, and informed the planning team’s strategy to extend the low- and mid-rise character of nearby residential neighborhoods, which would create signature waterfront destinations without absorbing a disproportionate share of demand from Center City’s building inventory and businesses. Additionally, HR&A explored phasing, financing, and implementation alternatives that leveraged the site’s private development potential to support essential first-phase public improvements and amenities. 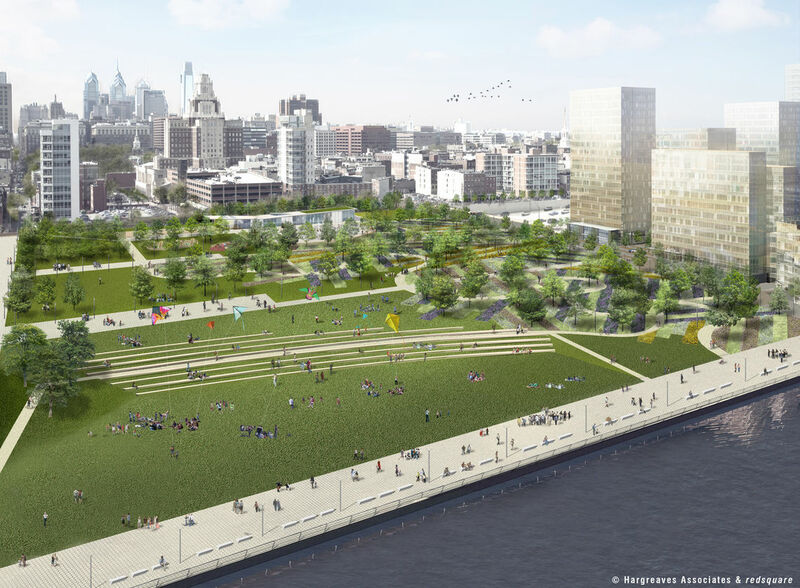 In 2014, HR&A joined a team of landscape architects and planners to advance the framework for open space and development at Penn’s Landing, Philadelphia’s premier waterfront event space. As one of the first-phase redevelopment sites identified in the master plan, the site included a range of activating uses including residential, retail, and an 11-acre signature park with neighborhood-scale public spaces that would provide key connections across the I-95 expressway towards Center City. HR&A assessed market demand for new development, and coordinated with the study team to evaluate multiple development scenarios, including associated phasing. The Philadelphia City Planning Commission adopted the master plan in 2012, and the Delaware River Waterfront Corporation is now advancing implementation. In 2015, DRWC selected a development partner to construct 550 units of rental housing, 30,000 square feet of retail, and significant public space at Spring Garden. This new development will complement a new entertainment center and nearly 500 additional units of housing now under way on private land surrounding the waterfront, spurred in part by Delaware River Waterfront Corporation advancement of five major infrastructure projects recommended under the master plan. 2012 Honor Award, American Institute of Architects.